It feels like an eternity since I last sat down to write a Weekend Blog post, but here we are again. I wanted to share a Weekend Blog post last week but unfortunately I became ill again. Every time I feel like I’m on the road to recovery I’m struck down with yet another cold or sore throat. I felt completely drained, but dare I say I’m feeling better now. The Christmas break can’t come quickly enough. So last week on Wednesday evening I had a hospital appointment over in Oswestry in Shropshire. When I moved to Liverpool I decided to move hospitals to one close to the city centre, but I wasn’t happy there and I wanted to go back to a hospital that specialises in orthopaedics. After months of waiting I finally got an appointment and it just happened to be with my old surgeon. Unfortunately the news wasn’t great. Just like all the other doctors I’ve seen he said there was no more they could do for me in terms of prolonging the life of my hip joint. The only option now is a hip replacement. So yeah, I’ve just got to keep having steroid injections until they’re no longer effective and then I will have a hip replacement. Of course, I felt disheartened to hear this news, but there’s not really much I can do about it, do I won’t dwell on it too much. My parents and I went for a McDonalds afterwards and had a good old catch up, so it wasn’t a complete waste of a journey. I’d booked the Thursday off work so I stayed over night in Shropshire and then headed back to Liverpool the following day. I’m pretty proud of myself because it was my first experience of driving on the motorway on my own, and it went really smoothly. I didn’t get lost or beeped at! Last Friday it was our company Christmas meal, and this year we went to the Shankly Hotel in Liverpool. I had such a good evening with amazing food and amazing company. And then I woke up on Saturday with this cold. At least I didn’t have a hangover from the night before. My parents popped in for a cup of tea and some homemade gingerbread on Sunday after they’d been to Cheshire Oaks, so that cheered me up. This week has been quieter, which is exactly what I want on the run up to Christmas. I had a bit of a wobble at the beginning of the week. My anxiety was pretty bad for some reason and I was full of self-doubt; particularly in regards to my blog. But fortunately so many of you lovely readers came to my rescue in my moment of darkness and picked me up. Then on Wednesday I received a Christmas card in the post from Joy with such a heartwarming message inside and a beautiful bookmark (see top picture). Joy’s card, as well as the kind messages of support I received on Twitter this week, made me realise how truly lucky I am to be surrounded by incredible people, even if they live on the other side of the world. This weekend I have completely finished my Christmas shopping, and I’ve finished wrapping the presents, so I’m ready to go back to Shropshire next week. 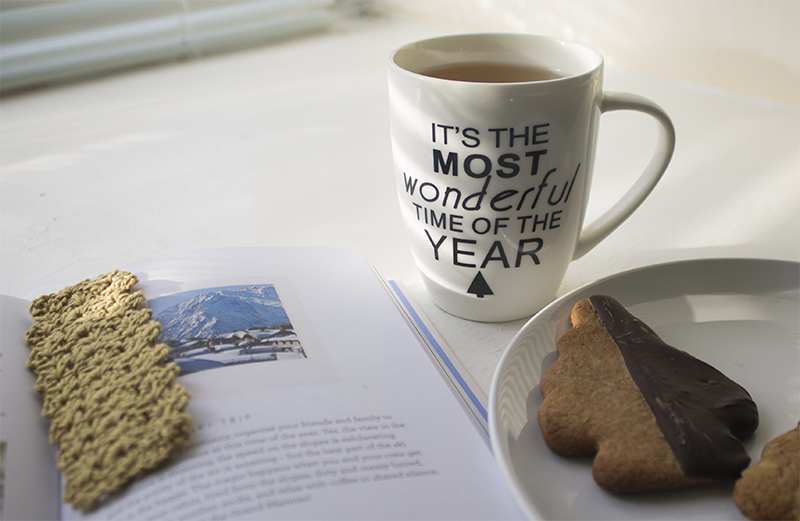 I’ve baked some gingerbread, had a vegetarian Christmas dinner and have caught up with my favourite blogs. It’s been the perfect weekend. Hope you’ll continue to feel better from the cold! I’m sorry to hear about the news from the hospital. Even though the option isn’t the best option, it’s still good to have one. Hope the steroid injections will help as long as possible! A hip replacement is a serious procedure. It’s definitely something to heavily think about. Joe’s bookmark is so beautifully crafted. I’m glad that her card cheered you up! It sounds like you’re ready for Christmas. Have a good week! Thank you! I’m taking lots of vitamin supplements so fingers crossed they help to keep the colds away! It certainly is. And once you start having hip replacements you have to keep having them every 15 years. So the longer I can postpone it the better. Thank you. 🙂 I think it’s so difficult for people like ourselves because we are so young compared to most people who are in need of joint replacements. A lot of the advice I’ve been given really doesn’t take into consideration my age, and when I ask questions about how it will affect having children etc. I don’t really get a straight answer. I hope you have a wonderful Christmas too!